236 Kelvin Grove Rd, Kelvin Grove. One 30 minute lesson each day for the 5 days, great to get a kick start toward an exam, master that technical work, prepare for an audition, or learn an instrument that you can’t fit in during term. Individual lessons are available in brass (trumpet, trombone, French horn), strings (violin viola, cello), woodwind (flute, clarinet, saxophone) piano, guitar, and vocals. Ellen Harle will run group theory classes to work towards sitting an AMEB online theory exam. The only cost will be your exam entry fee if you do sit an exam. This is a great way to get your theory prerequisites done and dusted! Do you have a chamber group that needs some guidance? Do you want to make a CD of demo songs? Are you particularly interested in learning singer/songwriter skills? Maybe we can help! 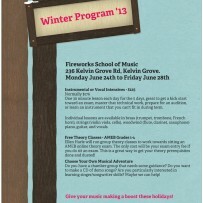 Give your music making a boost these school holidays! Call Ellen on 3352 6808 to book your lessons.